Could you sustain yourself on $5.70 worth of food a day? Could you keep your car operating on $4.25 a day to pay for gas, insurance, and maintenance? For homeless people like Jim, a Vietnam combat vet, the $177 he gets every month in food stamps and the $132 he gets in general assistance doesn’t begin to cover his most basic needs, but unlike the most visible members of our homeless population who beg for handouts on street corners, Jim works his “job” every day: gathering recyclable materials and trading them in for cash. 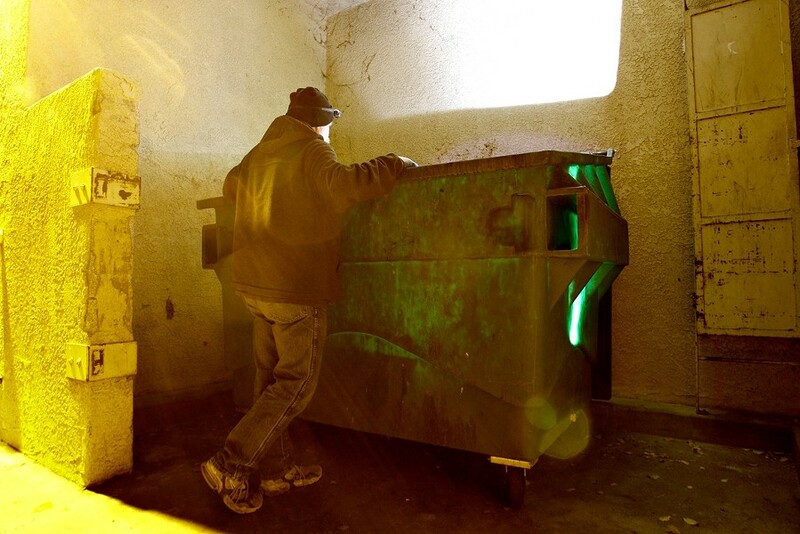 TRASH TO TREASURE : Jim, a homeless Vietnam combat vet with Post Traumatic Stress Disorder, supplements his meager government assistance by recycling. In 1970, fresh out of high school, Jim was drafted and quickly sent to Vietnam, where he became part of a Long Range Reconnaissance Patrol unit. The then-19-year-old kid soon found himself fighting for his life, an experience that haunts him to this day. After an honorable discharge, Jim attended San Diego State University to study accounting, but even back then he knew something was wrong with him. To ease his affliction, Jim turned to pills and booze. Despite his illness and addiction, he managed to hold down various accounting jobs through the early-Šs, though he continued to be a substance abuser. Twenty-three years ago, Jim became sober, but it didn’t stop the gradual strain of his disability. He continued to work, but his disorder ate away at him. The traffic, the noise, the crowds started moving in on Jim, and since he had been coming to the Central Coast for years and still had friends here, he decided to drive up here and see if he could recover. Jim had to put his pride aside. He had to learn to get inside dumpsters and root around for discarded glass, cans, and plastic bottles. He even learned to eat out of dumpsters. Such is the homeless life. Jim maintains a cell phone and has a laptop computer, where he keeps spreadsheets chronicling his monthly recycling hauls. He supplements his $300 in government assistance with upwards of $700 from recycling—most of it out of commercial areas and dumpsters whose contents were headed for the landfill. That’s still not enough income to allow Jim to find a home, especially considering he refuses to leave his longtime companion Mango, a Jack Russell terrier. Since becoming homeless and being unable to hold down a job, Jim has had his claims turned down from both SSDI (Social Security Disability) and the Veterans Administration, who each refuse to recognize his PTSD. His claims are currently under appeal. In the meantime, Jim continues with dignity and determination to help himself. “This is where I am right now, for better or worse. I don’t fight my disability anymore. I have to acknowledge my limitations. Thank God I’ve always been pretty healthy physically, except for a few cases of food poisoning. Unfortunately, it’s a lot more expensive to eat healthily than to go to the dollar menu at McDonald’s. But maintaining my car is imperative, and maintaining Mango to the best of my ability is imperative. Jim paused for a second and looked off into the distance. Staff Writer Glen Starkey can be reached at gstarkey@newtimesslo.com.